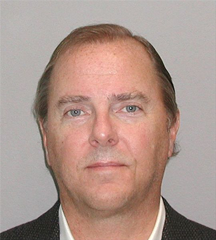 Jeffrey Skilling, in a mug shot taken in 2004 by the United States Marshals Service. Mr. Skilling is currently serving a sentence of 24 years four months at the Federal Correctional Institution in Englewood, Colorado. In connection with the collapse of Enron, he was indicted on 35 counts of fraud, insider trading, and other crimes. He was eventually convicted of one count of conspiracy, one count of insider trading, five counts of making false statements to auditors, and twelve counts of securities fraud. His crimes were executed during his tenure at — and immediately following his exit from — Enron, where he held a number of positions including CEO and managing director of Enron Capital & Trade Resources, and finally CEO of Enron. His activities entailed recruiting a large number of employees to execute his various schemes. To accomplish this, he relied on what many now agree was an exceptional level of charisma. This episode is an outstanding example of the threat to the enterprise posed by affective authority. Last time, we examined formal kinds of organizational authority — those that are conferred by institutions or by the organization itself. They are the kinds of authority that are most often in our awareness. Probably at least as important, however, is informal authority — that conferred by the people of the organization without the approval of the organization. Because organizations are so complex that we cannot possibly formalize all needed interactions, informal authority is essential. But it is also threatening, because it can undermine the intentions of the organization. Here are three examples. Affective authority influences by means of affect or presentation. In person or in recorded media, affective authority depends on charisma, manner, and demeanor. But it can also include eloquence, bearing, anger displays, charm, enticement, seduction, and more. In print or recordings, it further depends on production qualities such as design and aesthetics. It is the principal means by which we motivate and inspire. Because of its power, affective authority can threaten the organizational mission. Its power derives from its access to our emotions, outside our awareness. The threat to the organization arises because affective authority can lead us to make choices that undermine or conflict with organizational missions. organizational missionfrom bargains — written or unwritten — between people. In the bargain, one or several parties cede specific, defined authority to another, usually for compensation. Once the bargain is struck, either party can invoke the bargain to influence the other with respect to future bargains decisions. In healthy cultures, unwritten bargains proliferate. People honor them and value others who do. Some do abuse bargain authority, by reneging on or re-interpreting bargains, or by using bargains to manipulate or coerce others. In toxic cultures, bargain authority abusers succeed, but only at high cost to the organization. In healthy cultures, bargain authority abusers generally fail because they quickly exhaust the pool of potential bargain partners. Afflictive authority derives from the ability to inflict shame, pain, blackmail, threats, and other punishments or disincentives. Anyone willing to afflict others can potentially exercise afflictive authority. Afflictive authority is essential to human society because it is our primary means of personal defense. But it is also the basis of bullying. It is from skillful use of afflictive authority that bullies maintain their influence over others, including not only their immediate targets, but the bulk of the rest of the population that surrounds them. Afflictive authority is also found in ordinary toxic conflict. For example, in feuds or duels, the parties usually confer afflictive authority on each other. It is the principle vehicle they use to influence each other. Would you like to see your comments posted here? rbrenTVdsndkXKsGCZwoCner@ChacHwlgDzsWaNpOYrTSoCanyon.comSend me your comments by email, or by Web form. See also Organizational Change and Workplace Politics for more related articles. I offer email and telephone coaching at both corporate and individual rates. Contact Rick for details at rbrenAphQVClDSkfvOVvJner@ChaclkkEZQZIVccAiFlNoCanyon.com or (650) 787-6475, or toll-free in the continental US at (866) 378-5470.